The Push Award is given to several artists who push past the limit of social media, and this year, Twitter played an important role in the voting process. Avid supporters of the different personalities went on Twitter to campaign for their idols. At the end of the day, #MayWard proved they were the most influential tandem in the world of social media as they were given the Group/Tandem award while their fan base was recognized as the Ultimate Fan Club. See how the Push Awards 2017 conversation unfolded nationwide through this Twitter heat map and Twitter Moments. The Nickelodeon’s Kids Choice Awards honors the year’s biggest television, movie, and music acts and artists. This year, Nadine Lustre (@hellobangsie), Janella Salvador (@superjanella), Janine Gutierrez (@janinegutierrez ‏), and Liza Soberano (@lizasoberano) were nominated for Favorite Pinoy Star. On Twitter, fans battled it out to campaign for their favorite nominee by sending millions of Tweets using #KCAPinoyStar along with the hashtags of their favorite artist, #NadineLustre, #LizaSoberano, #JanellaSalvador, and #JanineGutierrez. In the end, Nadine Lustre took home the orange blimp and was named Favorite Pinoy Star of 2017. The Miss Universe competition was held at the SM Mall of Asia in January of this year. The return of Steve Harvey (@IAmSteveHarvey) as pageant host despite the epic mishap in 2015 piqued the interest of many Miss U fans. A whopping 34.6 million Tweets were generated globally during the coronation event in January – the highest Tweet volume this year for a telecast entertainment event. See more conversation about Miss Universe here. The #AlDubNation lit up Twitter with over 4.6 million Tweets as the pilot episode of “Destined to be Yours” (#DTBY) aired on television. Supercouple Maine Mendoza (@mainedcm) and Alden Richards (@aldenrichards02) played the role of Sinag and Benjie, respectively. Fans of the couple could not contain their excitement to see the two actors venture in the world of drama. Check out how Maine and Alden conquered the world of drama from this Twitter Moments. 2017 had been good to the Korean boy band Bangtan Boys or BTS (@BTS_twt). Their Wings Tour in Manila in May generated 3.4 million Tweets. On November 13, @BTS_twt hit another milestone as they gained 10 million followers on Twitter. See more conversation about their performance in Manila in this Twitter Moments. #LaLunaSangre is the third installment of ‘Lobo’ and the sequel to ‘Imortal.’ The hit horror-fantasy series immerses the public in the world of werewolves, vampires, and immortality. The show is a massive success with over 3 million Tweets generated during its pilot week and more than a hundred hashtags created in celebration of each episode. Filipinos across the country were in deep sympathy as President Rodrigo Duterte placed Mindanao under Martial Law due to invaders. Prayers and messages of support poured out for the victims and soldiers on Twitter; the hashtag #PrayForMarawi was created in honor of the locals, the brave soldiers fighting for peace, and the fallen soldiers. Supercouple #AlDub caught the eye of the public when Maine Mendoza (@mainedcm) and Alden Richards (@aldenrichards02) were paired in 2015. Their fan base grew over the years and in 2017, they held their second AlDub Nation Festival (#ADNFestival2017). Thousands gathered at the SMX Convention Center, and the festival sparked conversation all over the country generating over 1.1 million Tweets. The event coincided with maine Mendoza’s return on Twitter which shook the entire Twitterverse. 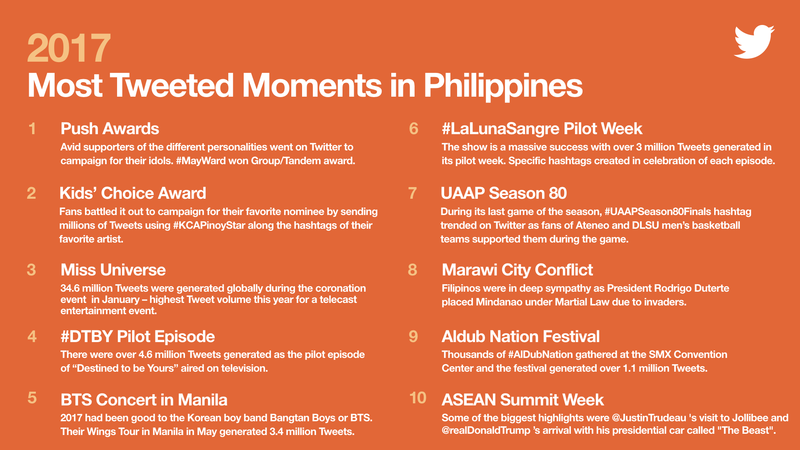 Catch a glimpse of the AlDub Nation Festival from this Twitter Moments. In November, several world leaders visited the Philippines to discuss high-level issues at the ASEAN Summit. Among other diplomatic events, some of the biggest highlights were the long weekend break for the civilians, Justin Trudeau’s (@JustinTrudeau) visit to Jollibee, and Donald Trump’s (@realDonaldTrump) arrival with his presidential car called “The Beast”.